There are a few absolutely killer signs along South Broad that take us back to the days when large neon placards were all the rage–Philip’s Restaurant & Cocktail Lounge, Bambi Cleaners, Meglio Furs and The Dolphin Tavern, to name a few. 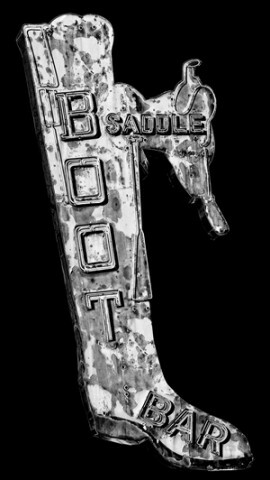 None are probably as kitschy-cool as the rusted country and western boot at the Boot & Saddle restaurant/concert venue near Broad and Ellsworth. Albert Stumm of the Passyunk Post reports that the famous sign has been taken down and will be restored. Peter Sutter of the South Broad Street Neighbors Association told the Post that neon specialist Len Davidson will be taking good care of the sign. After all, he’s handled some of your favorites, including the restoration of the Reading Terminal Market sign in 2006 and the creation of the 42-foot-long signage at the Trolley Car Diner. Restoring the sign had been one of the SBSNA’s stipulations for going along with reopening the bar as a music venue nearly two years ago, so it’s good to see the work finally being done. Other conditions governed noise, crowd control and amplification. One person even remembered that, “it was really weird. Occasionally, they would just play the National Anthem, seemingly for no reason. If you didn’t stand, you would be asked to leave.” How patriotic! There was a reason for it, though, as a majority of the clientele were sailors from the nearby Navy Yard.